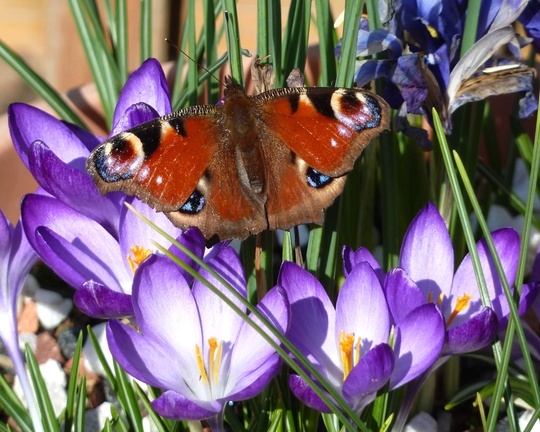 This springtime, the crocus flowers have been a magnet for butterflies. Beautiful, have seen quite a few butterflies in this recent sunshine. The Brimstone have been so vivid! I was lucky that this Peacock stayed still for quite a while so that I could get the camera in place ! That's flutterbys Fran, nice pic Terratoonie , Roy. It is so early in the season too. wow, what an amazing capture. Talk about being in the right place. You're right Bathgate ... I was lucky to be in the right place. Wonderfull capture Terratoonie the photo is lovely with colours of crocus and the Peacock butterfly. Beautiful photo. I saw a small tortoiseshell today which was a surprise as I didn't think they came till late summer.Have also seen the brimstone & a peacock. Fantsatic Picture Terra and lucky you having Butterflies! Brimstone here and I hardly saw a tortoiseshell last year so lovely to see one on my crocus the other day. yours looks a lovely big healthy specimen Terra, very artistic the way its sitting on the crocus! Thanks 3d, Feverfew, Neena, Sandra, Carole and Pam ..
What a lovely happy photo Terra! I hope you are having lovely sunshine today...we aren't, but I think you all deserve a break after the winter you've had down there! We had lovely blue skies today .. I hope you get more sunshine soon ! The butterflies are visiting early this year ! I was lucky that this Peacock was very co-operative. Very lovely Tt! Like you I've been watching the butterflies and bees, haven't they been enjoying the sun! Too right TT. They pose for you then flit off a split second before you push the button! Or close their wings and show their camouflage. The bright bits of sunshine have tempted them out. Fab piccie TT ~ You had your camera ready just at the right moment! I saw my first butterflies of the year when we were over in Cuenca, Spain visiting friends & family during the first 12 days of the month. The last few days on the allotments I've seen lots of butterflies - I think they were only Tortoiseshells. Seen lots of bees as well. Great capture TT. I am eagerly awaiting your spring garden photos!! Hi Terra, lovely photo's your gardens looking really nice. We've seen lots of bumbles bees and a few butterflies here too.